Wilfrid (634-709) is one of the greatest and also one of the most controversial English Saints. He directly influenced the move away from Celtic to the more orderly Roman church practices and is best known for championing and winning the case for the Roman, as opposed to the Celtic method of calculating the date of Easter at the famous Synod of Whitby in 664. He became Bishop of York with a See covering the whole of Northumbria, built magnificent stone churches at Ripon and Hexham. He acquired vast landholdings and established monasteries in Northumbria, Mercia, Sussex and the Isle of Wight and converted Sussex, the last vestige of paganism, to Christianity. He was the confidant of kings and queens but made many powerful enemies and was twice banished from Northumbria. He made three journeys on foot and horseback through Europe to Rome and was not afraid to seek papal jurisdiction over both crown and church where he felt badly treated. His life was threatened many times being shipwrecked and nearly killed by natives off the coast of Sussex, imprisoned in Northumbria by the king and twice nearly murdered whilst travelling abroad. 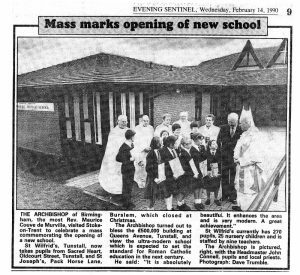 St. Wilfrid’s Catholic Primary School opened in January 1990 after the amalgamation of Tunstall RC (was located on Oldcourt Street, Tunstall, now houses on Stringer Court) and St. Joseph’s Burslem (was situated on Pack Horse Lane Burslem behind St. Joseph’s Church). The school took it’s name from Cotton College nr. 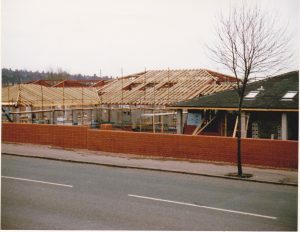 Oakamoor (or St. Wilfrid’s College as it was also known) that closed in 1987. St. Wilfrid’s Catholic Primary converted to St. Wilfrid’s Catholic Academy on the 1st September 2013 and serves the parishes of Sacred Heart Tunstall, St. Bernadette’s Fegg Hayes and that part of St Joseph’s Burslem appertaining to the school.